One of the more dangerous gods / goddesses - her name means 'the mighty one', she accompanied the pharaoh into battle. Her weapons were arrows (which would pierce hearts), and a fiery glow came from her body - hot desert winds came from her breath. She is usually shown as a woman with the head of a lioness - her terrible nature comes from her manifestation of an eye of Re sent to kill enemies of the Sun God (this can be seen in the legend of 'The Destruction of Mankind' - in which an aging Re who is angered by mortal's lack of devotion towards him, and so he sends Sekhmet to kill them all!... Re does regret this desicion, but once he has unleashed the fury of Sekhmet he has difficulty stopping her). Plagues and epidemics could also be the work of Sekhmet, but with certain rites (the rite of 'appeasing Sekhmet') she could be appeased once more. Given this violent image it is strange that Sekhmet was also a goddess of healing - when people became ill (caused by Evil spirits entering the body), who better to deal with this problem than a priest of Sekhmet (an early doctor) who could call upon his goddess to drive out the demons. 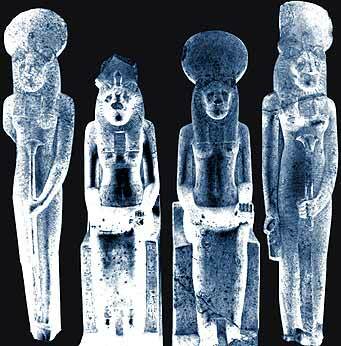 Sekhmet was part of the Memphite Triad - she was married to Ptah, and together they had a son, Nefertem. Sekhmet was also joined with Mut, it was in this guise of Sekhmet-Mut that Amenhotep III had almost 600 statues made to be placed at the temple of Mut at Karnak (these statues are on average 2 metres in height - 30 can be seen in the British Museum).